The concept of “home” is an interesting one to me. Although I call Kansas City my home now, other places feel like home when I am surrounded by certain people. Last weekend I took a short road trip through my home state of Oklahoma. My first destination was Tulsa where i spent a few days with three of my closest girlfriends from college for Estrogenfest…an annual tradition with no men, no children, lots of love, and lots of booze. It is like a boozy spa retreat for my soul. We talk. We laugh. We cry. We remember old times. We build each other up. We bring out the best in each other. It feels like home. I took back roads to get there from Kansas City. I like not traveling on the main highways during road trips so that I can see the forgotten pieces of slow American life. Slowing down is something I have to remind myself to do often. I was able to spend good quality time by myself and with my thoughts. I felt centered. I felt home. After a few days, I left my girlfriends and headed further south to see my family. Being with my brother and two sisters is one of the biggest rewards I get in life. I can sit for hours around them without saying anything and all feels right in the world. We laugh so much with each other…inside jokes get funnier, food tastes better, the hot summer breeze feels right. It feels like home. After a few days in OKC, I headed back to Kansas City. Even though I find comfort in the people that I see back in Oklahoma, Kansas City is my new home. When I am gone from here, I miss it more and more. The streets are becoming more and more familiar to me. I realize that other cities just don’t seem as pretty as Kansas City. I miss my rituals when I’m gone. I miss the tall trees from my neighborhood. I miss seeing the same people every morning during my morning jog. I miss cooking. I miss playing chess at night with my husband while drinking good beer. I miss visiting the same friendly farmers on Saturday mornings and asking how their farms are doing. I miss my home. 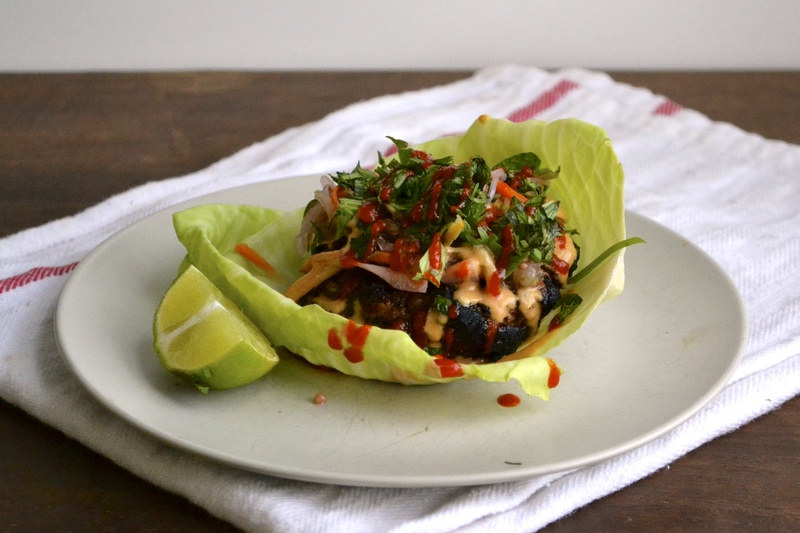 Weeknight dinners at my home often consist of burger-in-a-bowl. It’s super easy and refreshing. 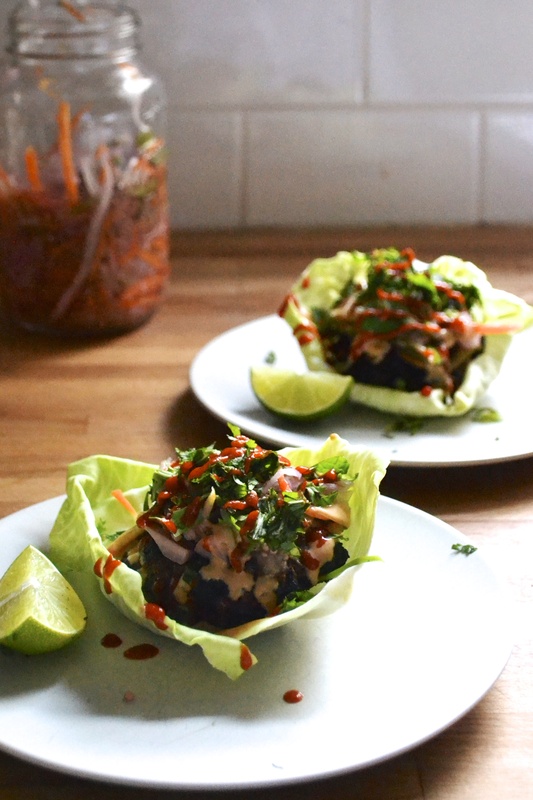 This past week when I got back from trekking around OK, I whipped up this Thai Burger-in-a-Bowl using a slaw I made with red cabbage from the market and tons of herbs from our garden. This is heavily inspired by my Green Curry Burger. I hope you enjoy this comfy recipe as I share it from my home to yours. 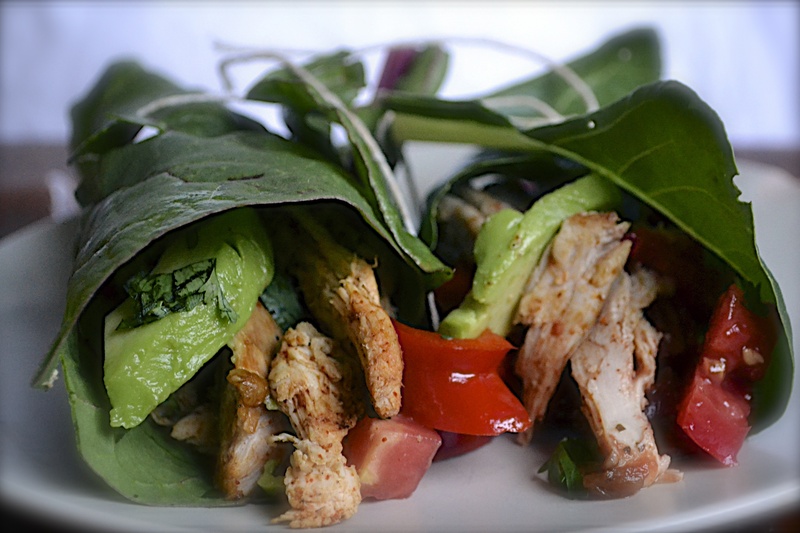 Adapted from my green curry burger wraps. Making Burgers – Combine all of the ingredients in a large bowl and mix with hands until ingredients are distributed throughout meat. Try to handle meat as lightly and as little as possible so that the meat does not become compact and tough when cooking. You are making burgers, not meatloaf, people! Form the meat into 4 equal-portioned patties, about ¾-inch thick. Make a dimple in the middle of the patty, pressing down with thumb or fingers. This will keep the burger from bulging during the cooking process and maintains juiciness. Sprinkle with additional salt and pepper and set aside. Making Slaw – Combine all ingredients in a large bowl. Mix well. Place in refrigerator while preparing everything else, mixing every once and awhile. Best if made at least 30 minutes ahead of time. Can be prepared up to 1 day ahead of time. 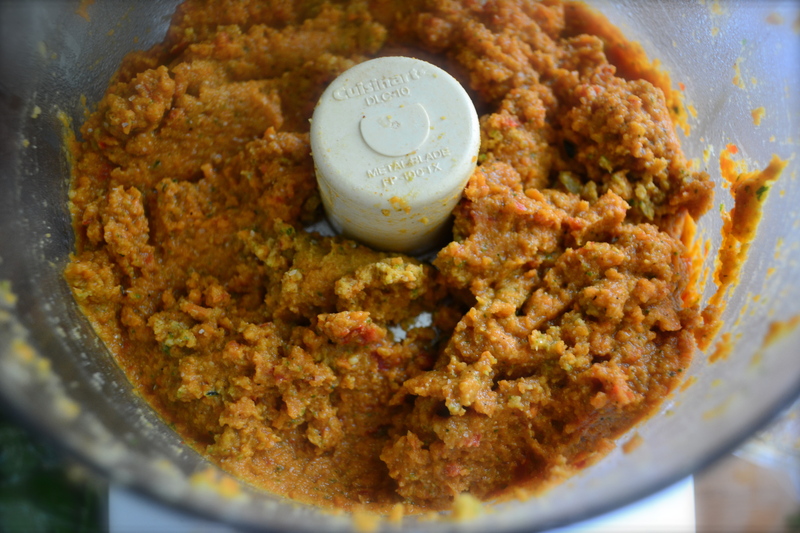 Preparing the Spicy Peanut Sauce – Combine all ingredients in a small food processor or bowl. Mix well. Set aside. Cooking Burger Patties – Prepare a gas or charcoal grill to medium-high heat. When the grill is ready, place the patties on the rack, cover, and cook, turning once, until done to preference, 3 to 5 minutes on each side. 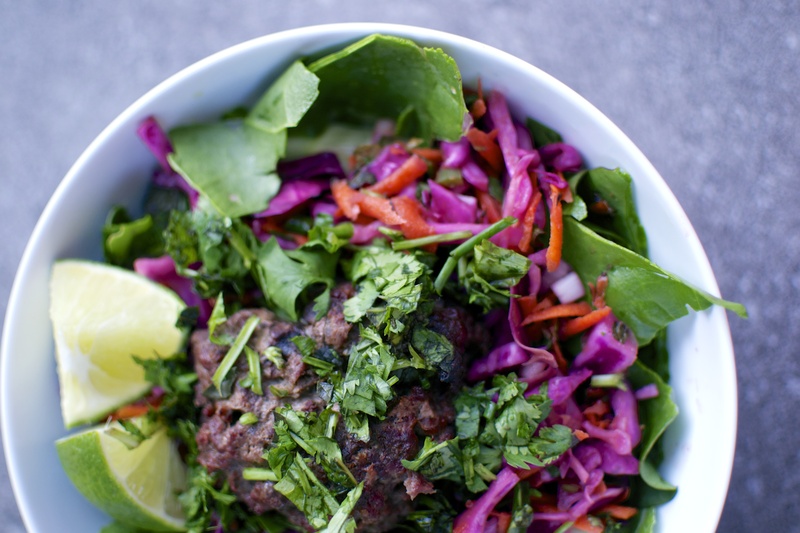 Assembling Thai Burger-in-a-Bowl – Divide greens among four bowls. Add about 1/2 cup of slaw to each bowl and then top with a grilled burger. Add desired amount of siracha and herbs on top of burger. Drizzle peanut sauce on top of assembled burger. Squeeze fresh lime juice on top of everything. Are you sitting down? Because when you taste this burger, I swear you will fall over. It is a religious experience and will fill you with joy. And best of all…this burg is a tastebud-party that you can hold in your HAND! YOUR HAND! This will revolutionize your tailgating burger experience. For those of us that don’t get to partake in burger buns, here is your chance at handheld goodness. 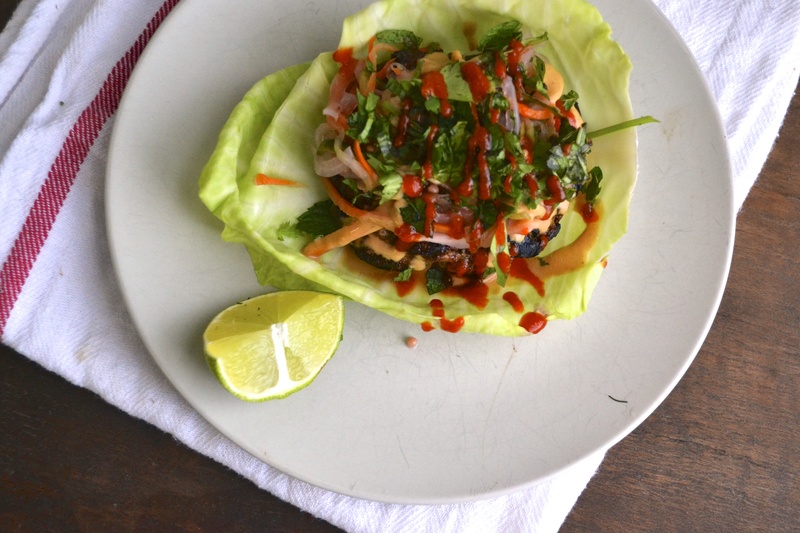 Portable spicy burger snacks are the best….especially when they are topped with peanut sauce. Mmmmm. This burger comes at you with green curry, spicy siracha sauce, tangy pickled slaw, herby freshness, and then the holy moly frijole PEANUT SAUCE. 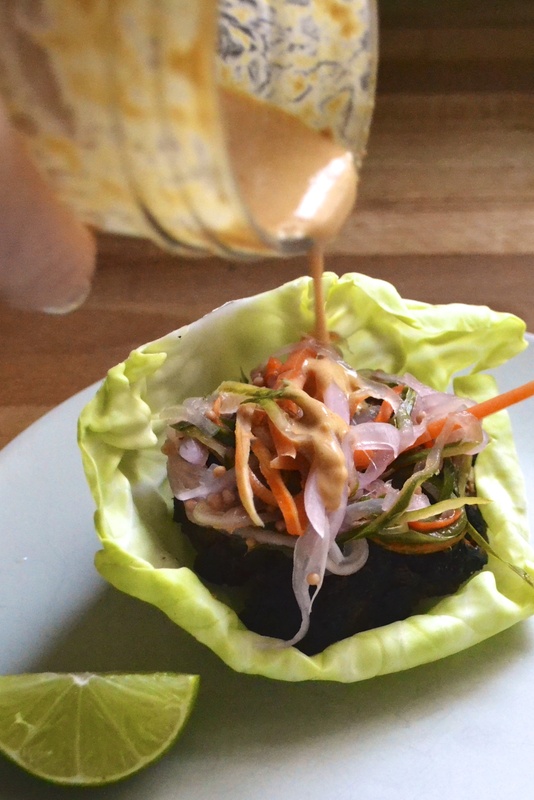 Seriously, this peanut sauce will change your life. Stick this recipe in your back pocket and USE IT. I am now an amazing fan of peanut butter on burgers. 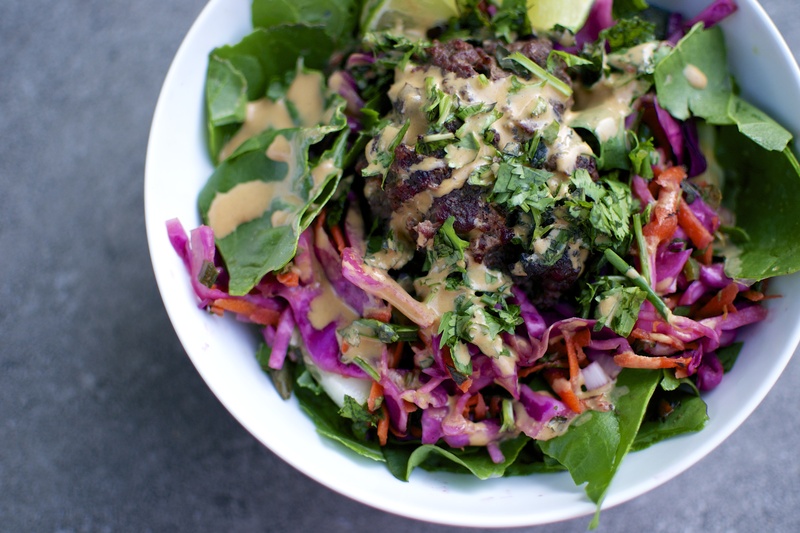 For a paleo friendly sauce, just replace the peanut butter with almond butter or sunbutter. Really. Just try it. Trust me. You won’t look back. Your life will consist of BPS and APS…life Before Peanut Sauce (BPS) on burgs and life After Peanut Sauce (APS) on burgs. Now the ingredient list below is a bit lengthy. But don’t let that scare you. These burgs come together pretty quickly once you get everything prepped. I promise it is worth it and it will blow the mind of anyone that you serve it to. These also are great sliders to prepare for a crowd for football watch parties. But if you make them, just invite me. Because I can’t get enough of them. Making Patties: Combine all of the ingredients in a large bowl and mix with hands until ingredients are distributed throughout meat. Try to handle as lightly and as little as possible so that the meat does not become compact and tough when cooking. Marinate meat for 15 minutes before making patties. After 15 minutes, lightly form the meat into 4 equal-portioned patties, about ¾-inch thick. Make a dimple in the middle of the patty, pressing down with thumb or fingers. This will keep the burger from bulging and maintains juiciness. Peanut Sauce: Combine all ingredients in a food processor or blender. Blend until smooth. Set aside. Cooking Patties: Heat a gas grill to medium-high. When the grill is ready, brush the grill rack with the vegetable oil. Place the patties on the rack, cover, and cook, turning once, until done to preference, 3 to 5 minutes on each side. 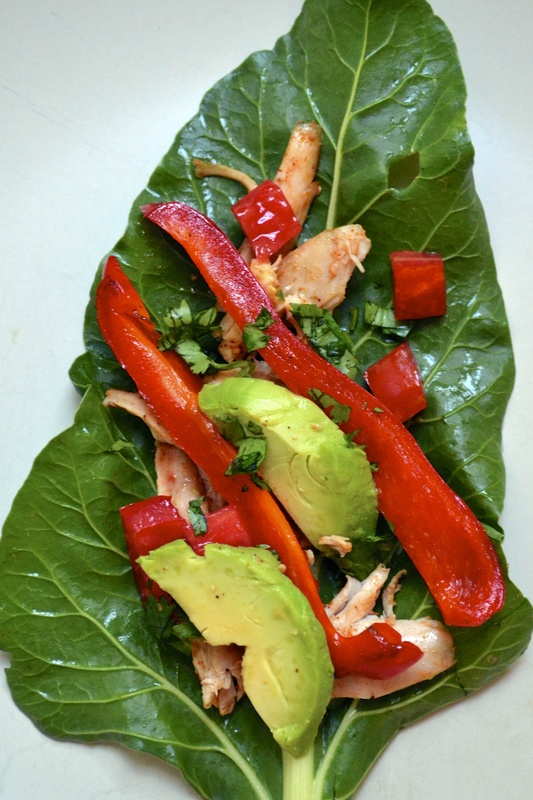 Wrap Fixins and Toppings: Mix herbs in a bowl and set aside. Wash cabbage leaves and allow to dry. 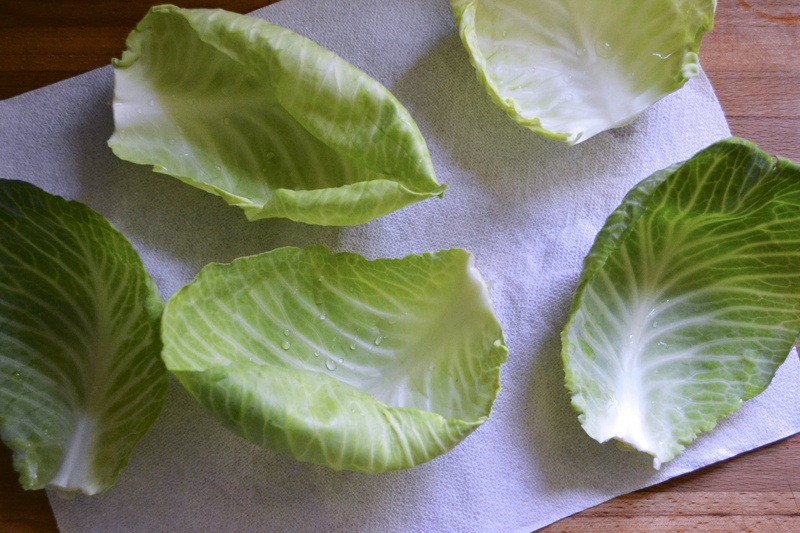 Assembling Burger Wraps: Lay out washed and dried cabbage leaves. 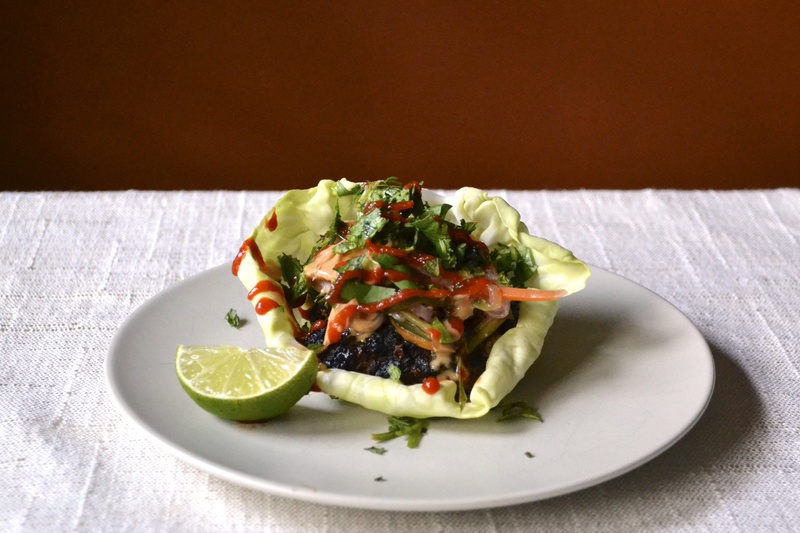 Spread 1 teaspoon of siracha in the bottom of each cabbage leaf. 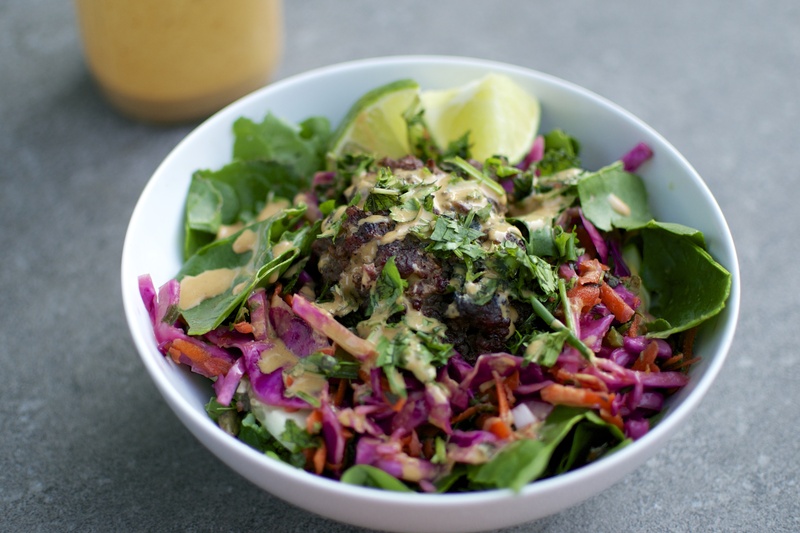 Then on top of the cabbage leaf, place one grilled patty, then one heaping tablespoon of peanut sauce, then add 1/3 C of pickled slaw, and then top with one heaping tablespoon of herb mixture. Spread additional siracha and fresh lime juice on top of your burger wrap. I’m going to make this short and sweet….just like this recipe. It’s hot. So hot. My oven is staying off…so off. 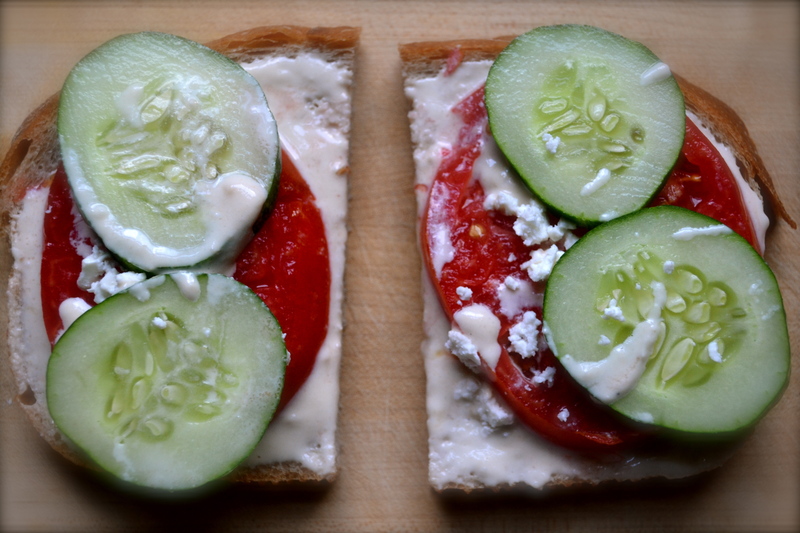 But you know what is not hot…this open-faced sandwich. She’s cold. Nice and cold to break that heat. 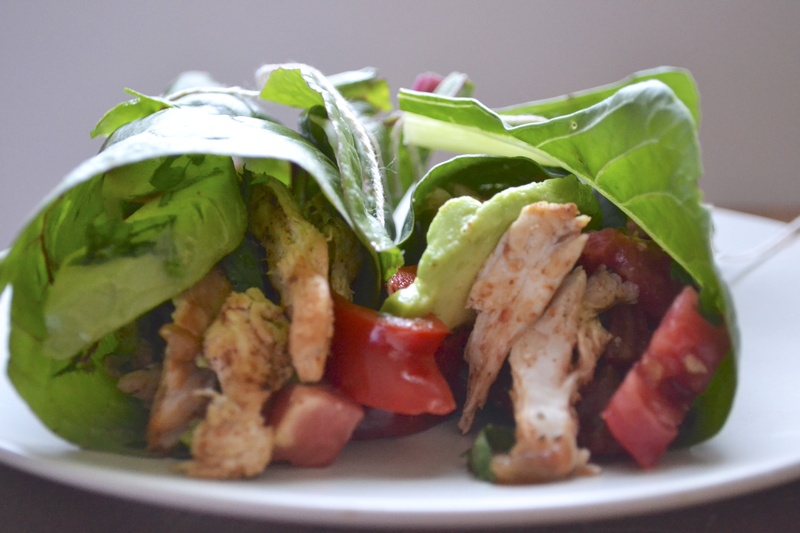 This is an awesome quick lunch or light dinner. The tahini-miso spread is quite addictive. 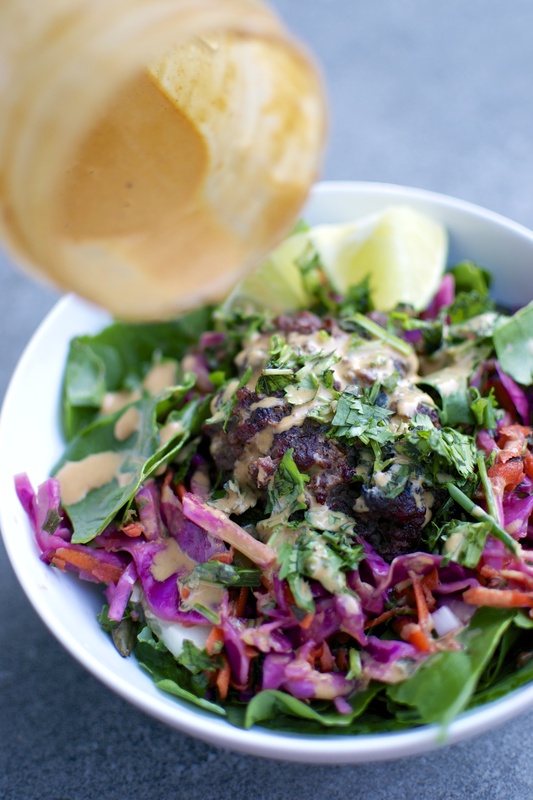 You can add a bit of water to it, thinning it out to use as a dressing for kale salads or veggies as in Cookie and Kate’s Raw Kale Salad with Creamy Tahini Miso Dressing. Brilliant. Alright..got it? Good. 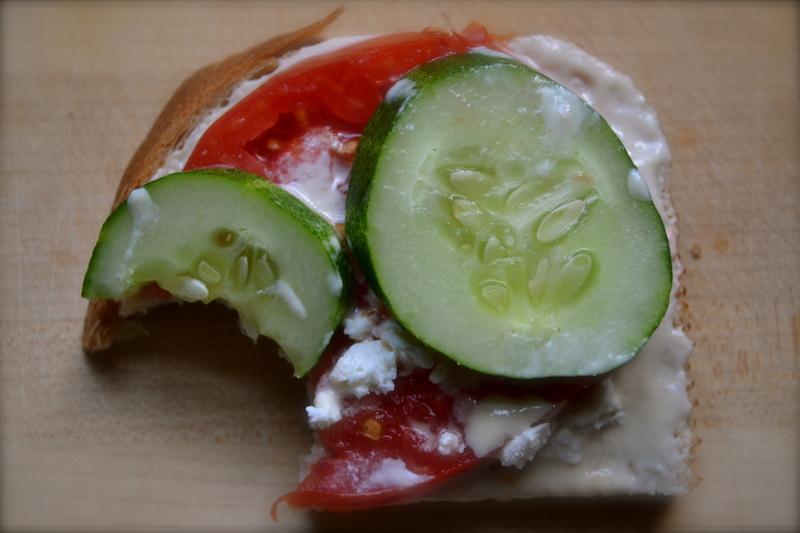 Oh and this cute open-faced sandwich is loosely based on Mark Bittman’s Updated Tea Sandwiches. This recipe was chosen by Aura of Dinner with Aura. Check out the other recipes here at the Food Matters Project page. 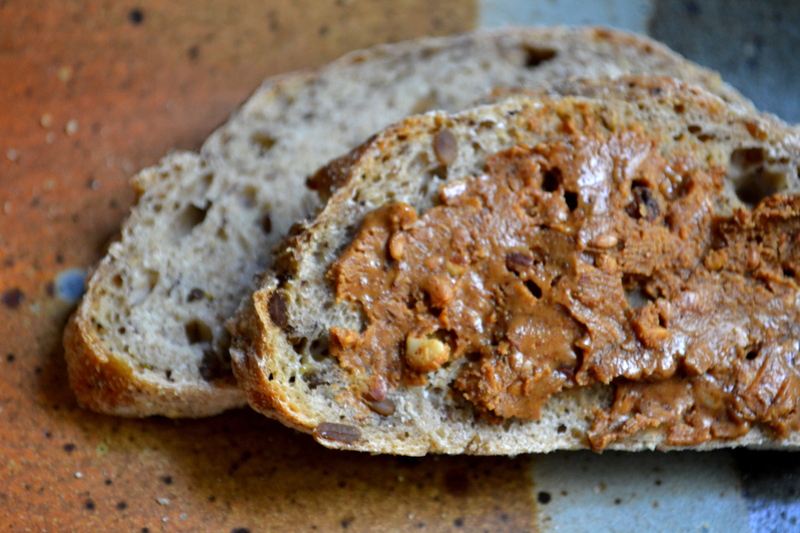 Spread 1 tablespoon of tahini-miso spread on each slice of bread. 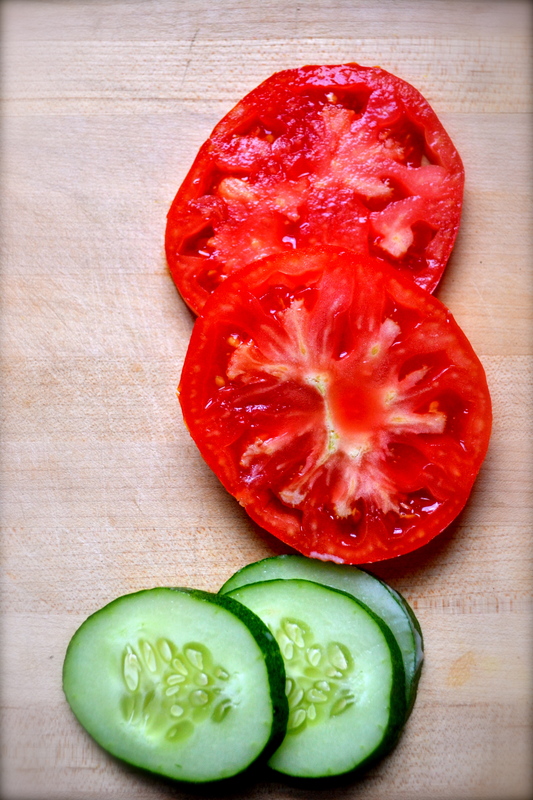 Layer tomato slices and cucumbers. Sprinkle with feta. Enjoy! To use as a dressing for salads, add 1/4 cup of water. Spread/dressing can be stored in the refrigerator for a week. Hellooooo summer. I went on a lazy bike ride one evening this weekend and watched families grill on their patios, kids running through water sprinklers, in promptu baseball games in neighborhood streets, old couples walking hand in hand down the trail by our house, and dogs playing fetch with their owners. Lightning bugs danced around me and the first chirps of cicadas filled the air. It was magical and classic. The change between seasons and its effect on people is so curious to me. During the short cold days of winter, we stay tucked away in our homes, hybernating and watching reality TV. But as spring and summer hit, bringing with them longer and warmer days, people bloom like the vegetables and flowers in gardens. They open up their homes and patios to their freinds and family, communing with one another and experiencing the outdoors. Neighborhoods turn into blockparties every night. It sometimes feels like a scene out of a Norman Rockwell painting. Another awesome thing about summer versus winter is that food turns from heafty casseroles to finger foods! And oh how I looooove finger foods. Huge burgers leave me lethargic, but sliders….I can have two DIFFERENT kinds. This is perfect for a gal like me that can not make up her mind when it comes to food or anything really. 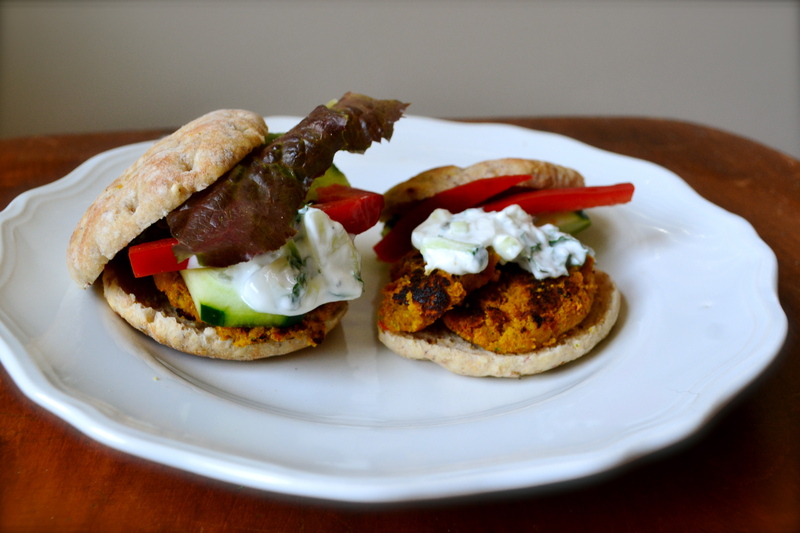 If you are looking for a handy dandy finger food to take or serve at a party, these falafel sliders are perf. This recipe is adapted from “Braised Chickpea Fritters and Vegetables” from Mark Bittman’s Food Matters Cookbook and was chosen as part of the Food Matters Project by Lena of Mrs Garlic Head. I adapted them to be spiced with curry and carrots, plus turned them into a picnic totin finger food. The curry kick makes them a winner for even meat lovers. For this falafel, use uncooked chickpeas that have soaked overnight. You will need a good food processor to create the chickpea “flour” and mix in the additional ingredients. Baking the falafel makes them a bit crumbly, but still delicious. If you prefer, you can pan fry them in a bit of olive oil or coconut oil. The leftovers can either be frozen or refridgerated. I ate the leftovers cumbled over a delicious kale salad. Preheat oven to 375F. Oil a roasting pan with 1 to 2 tablespoons of olive oil or coconut oil. In a food processor, combine soaked and drained chickpeas, onion, cilantro, garlic cloves, cumin, curry powder, carrots, baking powder, salt, and pepper. Process until smooth, about 1 to 2 minutes. 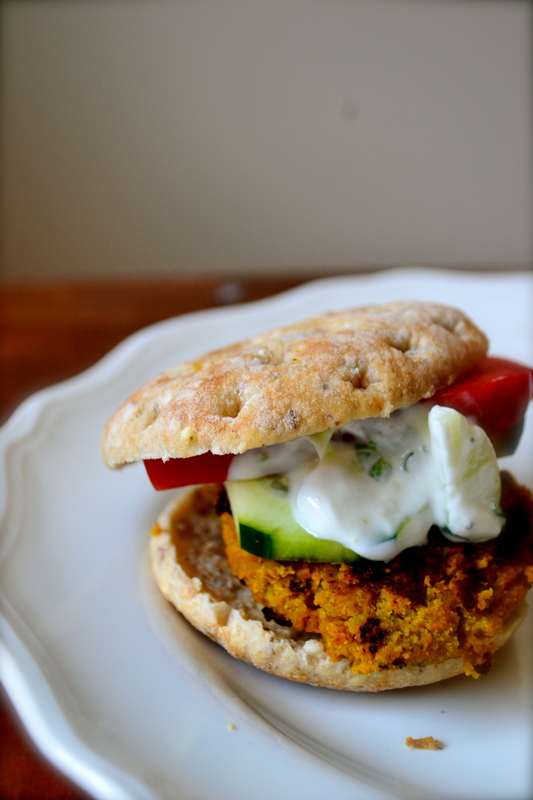 Scoop out 1 tablespoon at a time and shape the falafel into small 1-inch patties at 1/4 inch thick. Place each falafel pattie in the well oiled roasting pan. Bake for 10 minutes. Remove the roasting pan and flip the patties carefully. Place the roasting pan back into the oven (middle rack) for another 10 minutes. The patties will be light brown. Assemble your sliders with small whole grain rolls or pita flats, sliced cucumbers, red peppers, and cucumber-mint raita (recipe below). Instructions – Mix above ingredients together in a medium bowl. Season with salt to taste. Unfortunately, I am traveling and living out of a hotel right now doing field work for my job. YAY…I actually feel like a wild lion that had been put in a zoo for years and is finally able to go home to the jungle. Except my “jungle” is a landfill construction site…oooooh! Hot, I know. Anyways, because of my recent “being let back into the wilds of field work” and living out of a suitcase, I was not able to complete the Food Matters Project’s weekly challenge….Roasted Asparagus and White Bean Soup chosen by Adrienn Eats. Sound delicious, so be sure to check out the recipes on the FMP site, here. 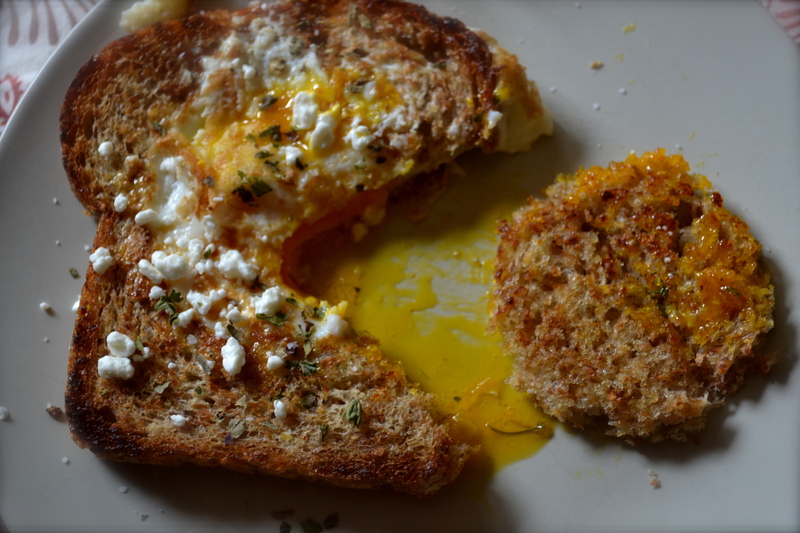 Instead…I present you with one of my all time favorite and easiest breakfasts…..egg in a basket. 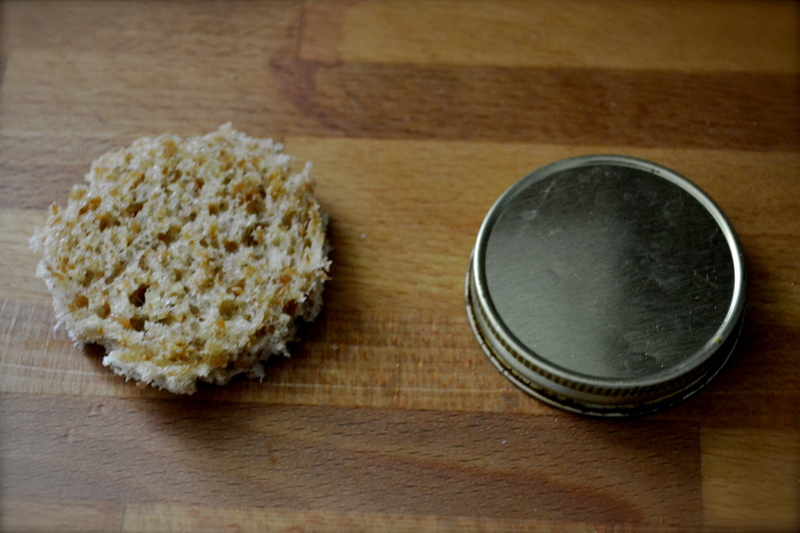 Take a piece of GOOD bread, generally 1/2-inch to 1-inch thick. Cut out a circle. Heat some butter in a pan. Throw your bread in the pan. Break the egg into your “basket”. Cook. Flip. Eat. Well…put it on a plate, THEN eat it. Mmmmm. Have I mentioned to you that I looooove breakfast. And I loooooove eggs. And since I love a good juicy runny egg….and toast, it seems only natural to cook the two together. At the same time. Using fun shapes. This breakfast takes 5 minutes…..or less….literally. So try it out, have some fun. Sorry for the short post, but so is life from a hotel with a terrible internet connection. Cut out a small circle inside your toast using a biscuit cutter, fun cookie cutter shape, or simply the top of a jelly jar (should be about a 2-inch diameter circle). Spray a skillet with nonstick olive oil spray. Heat the skillet for a minute, but don’t let the spray start smoking. If you are using butter, heat 1 tbsp of butter over medium-high heat until the butter begins to foam and subside, but not smoking. Lower the heat to medium-low. Place the slices of bread in the skillet (may need to do this one at a time depending on the size of your skillet or griddle pan), quickly break the egg in the whole filling with egg white first then carefully add the yolk. Cook for about 2 minutes, until the bottoms of the egg-baskets are set and golden brown. Add the bread cut-outs to the pan and allow to toast on both sides. Flip carefully and cook for an additional 1 to 2 minutes for runny eggs or 3 minutes for firmer eggs. Make sure to flip your bread cut-outs too. Remove from skillet. Top with salt and pepper. If you are feeling fancy shmancy, add some fresh herbs and goat cheese crumbles. 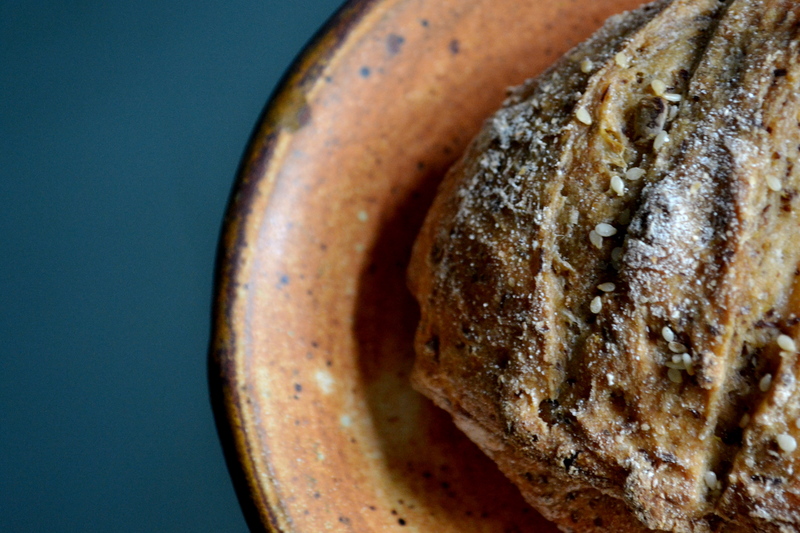 I have always romanticized about owning a bakery….waking up early to bake fresh bread and pastries. Locals coming to get their fresh baked breads every morning…but then there is the problem with me not being a baker of breads. I had never quite gotten the knack until I learned the No-Knead meathod that Jim Lahey (of famed Sullivan Street Bakery) founded years ago. Since learning this method, I have never gone back. It’s genius. Throw all the flour, yeast, and salt in a bowl…add water…stir…let the shaggy mess rest for several hours (best if is allowed to rise for 12 to 24 hours)…then pull it out of the bowl, roughly shape into a ball or football, then bake. Bam. 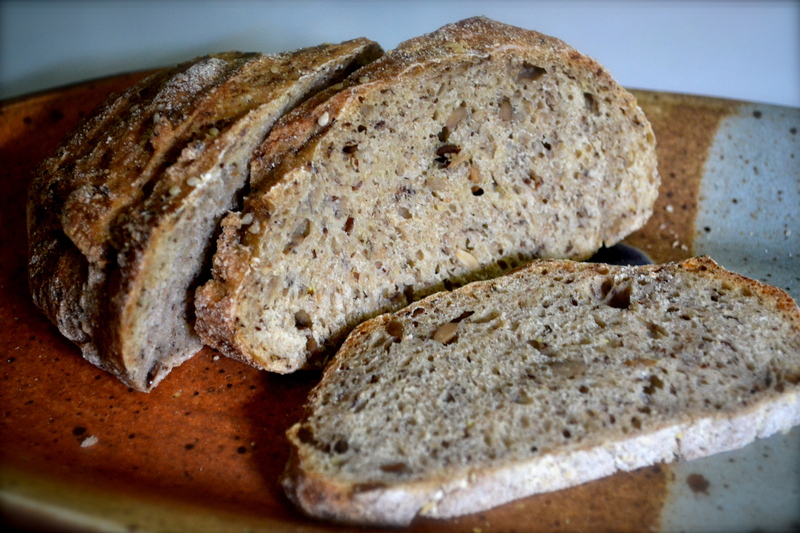 Delicous, house warming, belly craving bread. Slather butter on it or PB or eat it plain. Daaang. 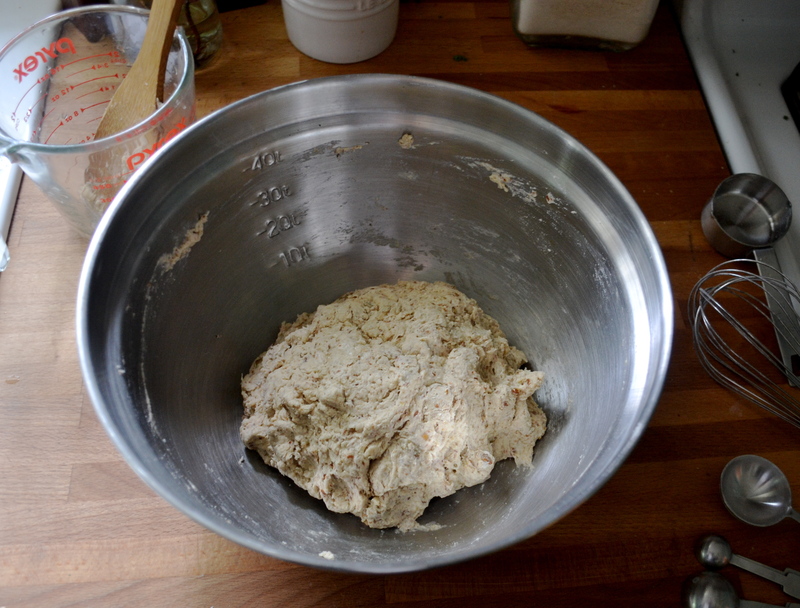 No kneading and no waiting to see if your bread has risen and fallen then risen and fallen again…none of it….none. It’ll change your life (and your waistband if you bake too many loaves like me..hehe) and save you a poop ton of money. That’s right…a poop ton. Make your own bread and impress friends and family. Or impress yourself, because really that is all that matters. Now, although the primary recipe is Mark Bittman’s, my baking method is not technically Mark Bittman’s method. I prefer an artisinal appearance or free form with a crusty exterior. I also like smaller loaves, which is why I divided the recipe below into two beautiful football shaped loaves. You can definitely bake this in a loaf pan if you want. But a few years ago, I found a book at an estate sale called “Health Bread in Five Minutes a Day” by Jeff Hertzberg and Zoe Francois that takes the no-knead method to another level, cooking the bread on a baking stone in a super hot oven (450F) and trying to mimik hearth-style baking. You will get professional looking loaves every time and it is super easy. Before you jump elbows first into bread baking, here are a few notes about bread and the primary ingredients…. 1. Yeast hates hot water…it will kill those suckers. So use luke-warm water. This means that the water feels just a little warm to the touch (no hotter than 100 degrees F). Cold water from the tap will work also, but the initial rise time will take much longer. If your water at home has a funky flavor, I recommend buying distilled or filtered water, because your bread will then get the funk…and not a good funk. Otherwise, tap water will be fine. 2. Make sure your yeast is fresh. Store in the fridge to make it last longer. 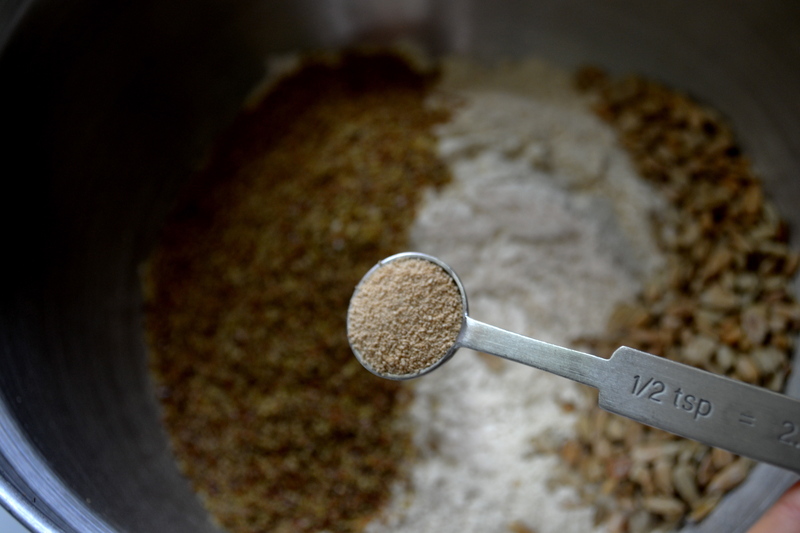 Initial rise times are slower if you use less yeast (1/2 teaspoon versus 2 teaspoons). If you want to speed up the rise time, increase the quantity of yeast up to a 2 teaspoons (one full packet) for the below recipe. If you double the below recipe, use 1 1/2 tablespoons of yeast. If you plan on making a lot of bread, buying yeast in bulk (a jar instead of those pesky packets) will save you money. 3. 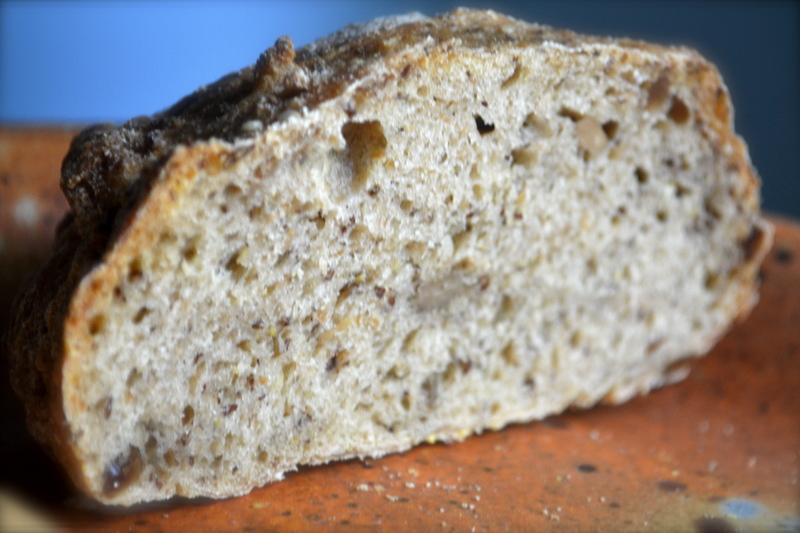 Boost nutritional value in your breads by using 100% whole wheat and adding healthy seeds within or on top of the bread. Seeds can include sesame, flaxseed, caraway, pumpkin, sunflower, poppy, and anise. 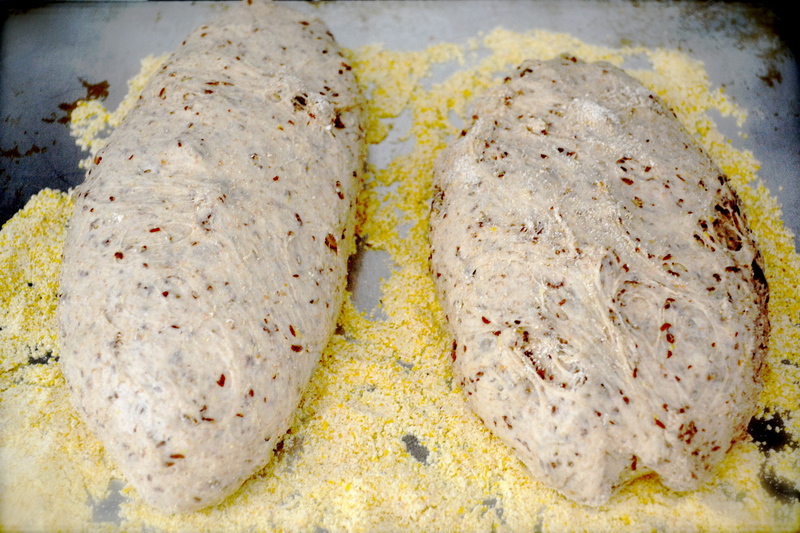 To top the bread, paint the surface of the loaf with water before sprinkling the seeds on the loaf. 4. Baking stone – A baking stone will give you the best results for a professional-looking free form loaf. The stone absorbs excess moisture from the wet dough, allowing the crust to become crisp. Mmmm. Also the weight of the stone helps with heat retention and provides even heating and heat transfer to the loaf. Sorry for the excessively long post, but it is worth it! This is why I’m late in posting it. Also, don’t forget to see what the other FMP foodies did with this recipe at the Food Matters Project home page. 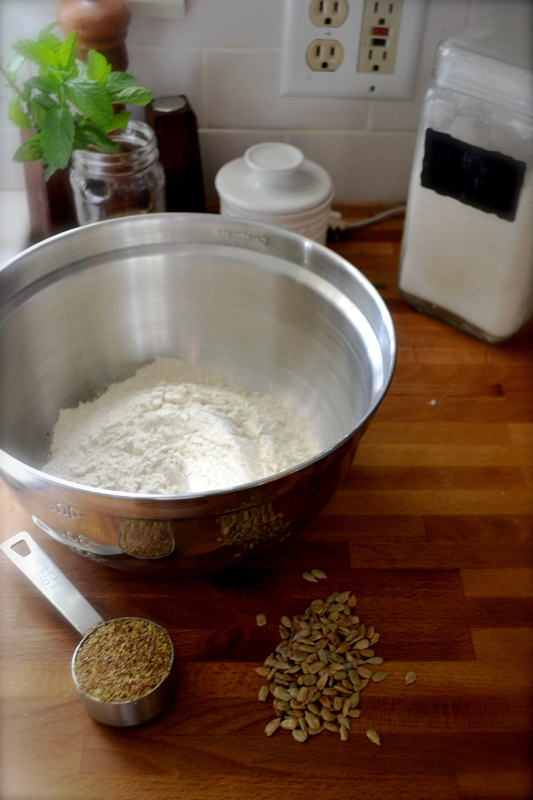 Combine flour, salt, flaxseed, sunflower seeds, and yeast in a medium 5 qt bowl. Add water and stir with a wooden spoon till combined. 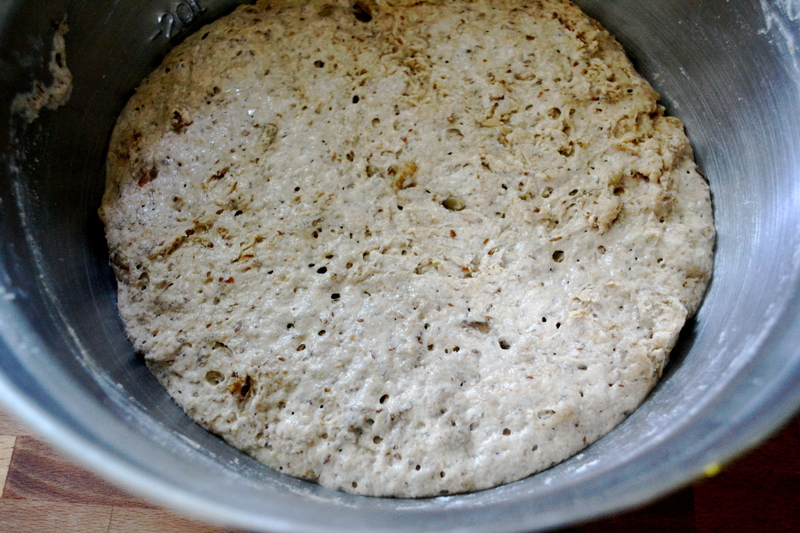 The dough should be wet and shaggy and resemble biscuit dough or batter. Cover (not airtight) with plastic wrap or damp towel. Allow it to rest at room temperature until it rises and collapses (or flattens on top with bubbles) at least 2 hours, but it is best when left 12 to 24 hours. (If your house is cold, turn the oven on to 200 F then turn it off, placing the dough on the oven to rise). The dough can be used immediately after the initial rise, or it can be refrigerated in a lidded (not airtight) container and used over the next week. You can lop off smaller pieces and bake smaller portions, storing the rest in the fridge until you are ready for fresh baked bread. When you are ready to bake the bread, dust the surface of the refrigerated dough with flour and shape into a ball by stretching the surface of the dough around to the bottom on all four sides, rotating the ball a quater-turn as you go. At this point you can either place in a loaf pan or bake on a pizza peel for an artisinal loaf. For the artisinal loaf, place the loaf to rest on a greased cookie sheet (can also dust the cookie sheet with cornmeal). Loosely cover the dough with plastic wrap and allow to rest for 1 1/2 hours. At leasat 30 minutes before baking, preheat oven to 450 F with a baking stone placed on the middle rack of the oven. Place an empty metal broiler tray on the lowest rack, making sure that it won’t interfere with the rising bread. Just before baking, dust the top of the loaf with flour and then slash the loaf with a razor or serrated knife with 1/4-inch-deep parallel cuts. Slide the loaf directly onto the hot preheated pizza stone (or you can place the greased cookie sheet directly on the stone if you can’t slide the loaf off of it). Pour 1 cup of hot tap water into the preheated broiler tray and quickly close the oven door. Bake for 30 to 35 minutes, or until the loaf is browned and firm. Note: If you used a cookie sheet, remove the bread from the cookie sheet at 20 minutes and bake the rest of the way on the pizza stone. Remove from the oven and allow to cool on a wire rack before slicing and eating. I love hugs. Nothing is better than a hug when you feel alone, or scared, or stressed. I wish I could bottle hugs…sounds goofy, but it would be a best seller. You’d buy one, right? Like handshakes, hugging can also be done incorrectly. The back pat…what is that! Some people are born huggers….their arms swallow you and pull you in. With a hug, they show you how much you mean to them. 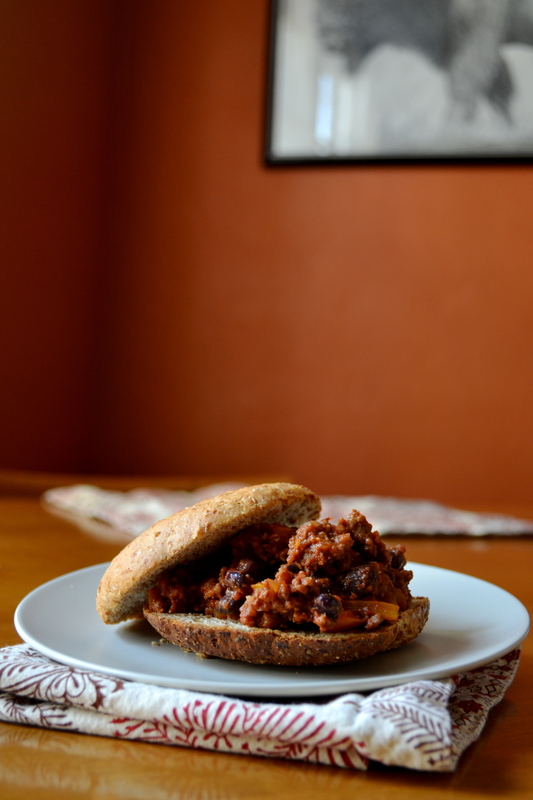 To me, a good Sloppy Joe is like an awesome bear hug. The canned variety…well that’s a back pat…bleh. 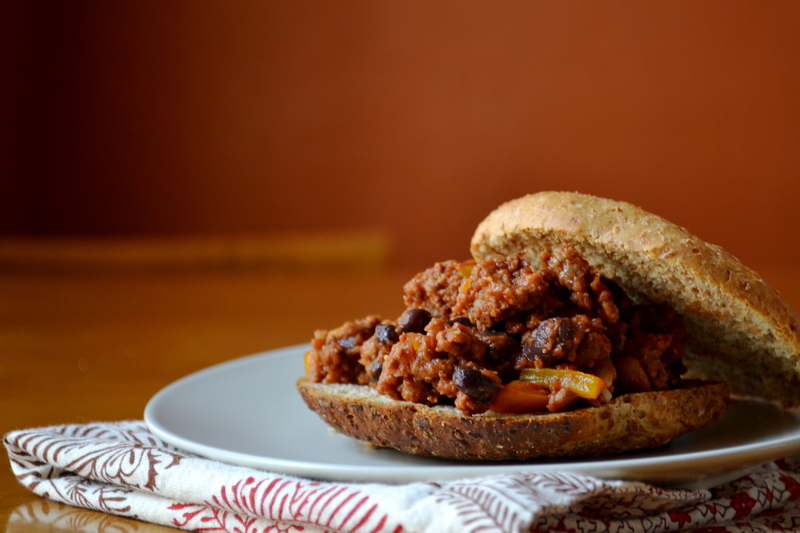 This Sloppy Joe recipe is adapted from Ellie Krieger. It was one of the first things that my husband started cooking for me after we got married. 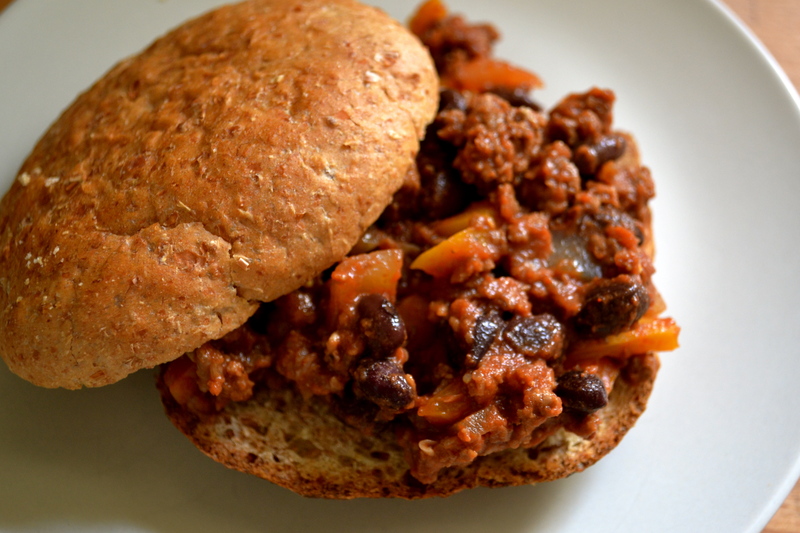 It is sweetened with molasses, spiced with jalapenos, and veggie-chunked with bell peppers and beans. Yes Beans. This is definite cowboy food. They are so harty that we usually eat these puppies open faced with a fork. Ya Ya Ya, I know. What fun is it to eat it with a fork, you say. Well take it from me, I can’t eat ANYTHING without it ending up in my lap, hair, and behind my knees (weird, I know). So I must resort to a fork to keep from ruining ALL of my clothes. Or I should just wear a bib. Ok. I’ll wear a bib even when I use a fork. Don’t judge! Notes: The ingredient list looks long, but don’t get overwhelmed. It is super easy and the ingredients are located in your cupboard or fridge. Brown ground beef in skillet over medium heat until no longer pink. Drain any grease from pan. Add onions, pepper, and jalapeño and cook until onions are translucent. Add minced garlic and cook for an additional minute. Mix tomato paste, water, molasses, worcestershire sauce, dijon mustard, and red wine vinegar in a small bowl until combined. Add to the skillet with the ground beef mixture. Simmer over medium-low heat for 10 minutes. Add beans, salt, and pepper. Heat until beans are warmed through, about 5 minutes. Remove from heat. Serve over whole wheat hamburger buns. I love cheese. I especially love MELTED cheese. So a grilled cheese sandwich is one of my all time favorite sandwiches…plus it is super quick. But think outside the box of your normal buttered bread and american cheese. 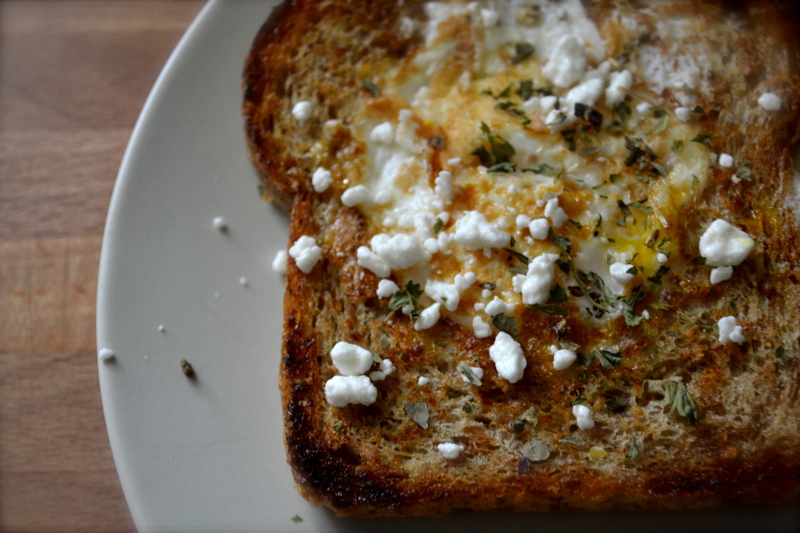 I love melted goat cheese…creamy and tangy. I also threw on some raw milk cheddar. I’m always looking for a way to sneak veggies into things. It’s a sick obsession that I have. My other obsession being ketchup, but that’s another story. Kale is fresh green that is available in the winter when spinach is scarce. If you boil kale, it will become soft. However, if you roast or grill kale, it takes on a new consistency…crispy and crunchy. 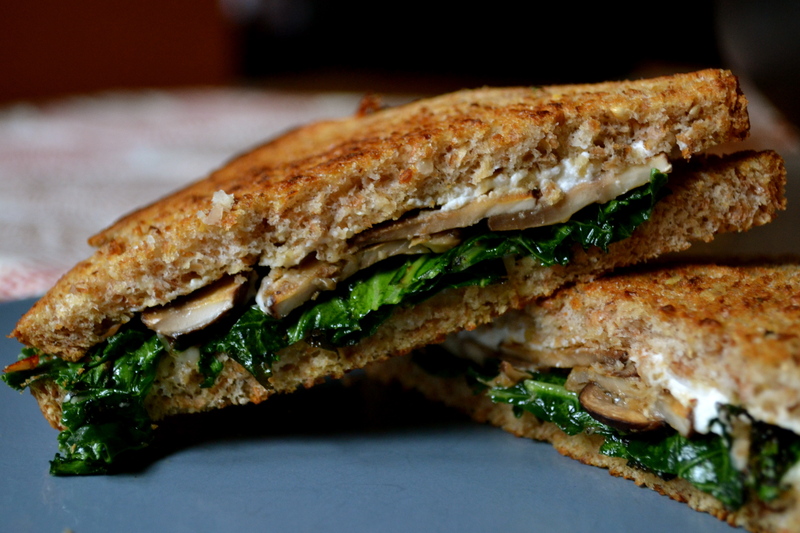 To a sandwich, crisp kale adds a great change. 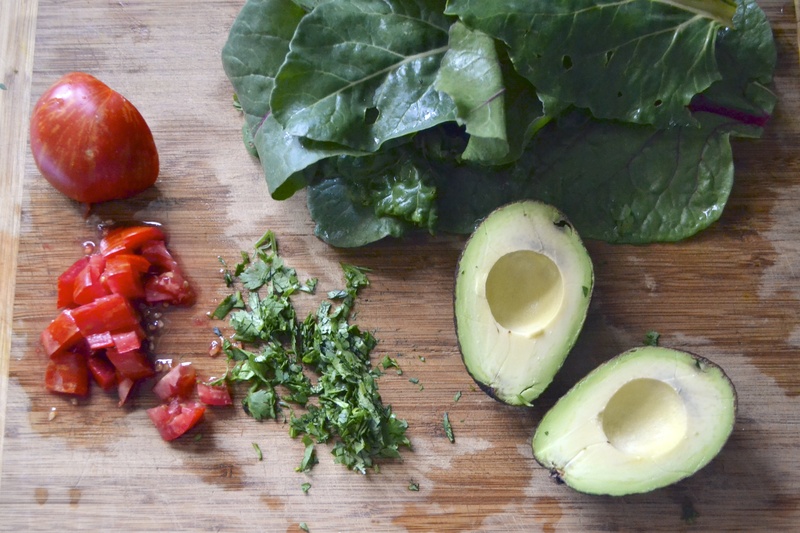 But if you don’t have kale, feel free to mix up the veggies with what you have on hand or with what is in season. Spray a griddle pan with nonstick spray. Spread butter on both sides of bread or spray both sides with nonstick spray. 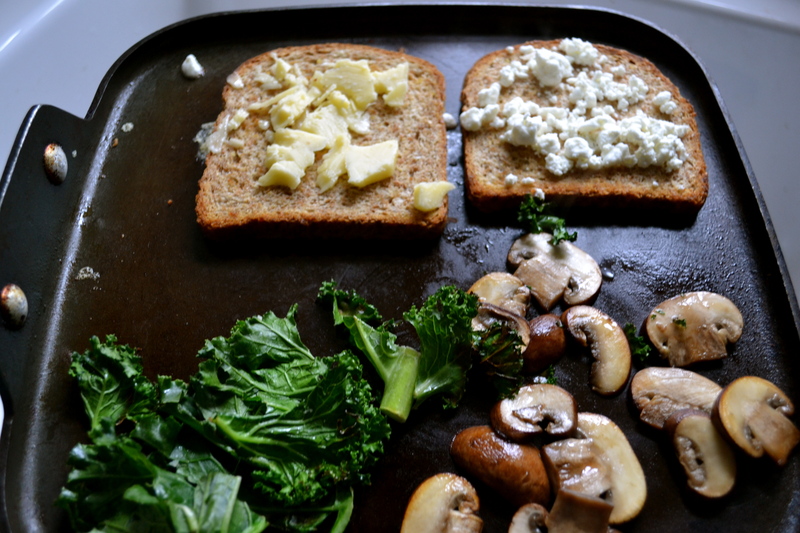 Place veggies on griddle. Mushrooms and kale will take about 5 minutes. 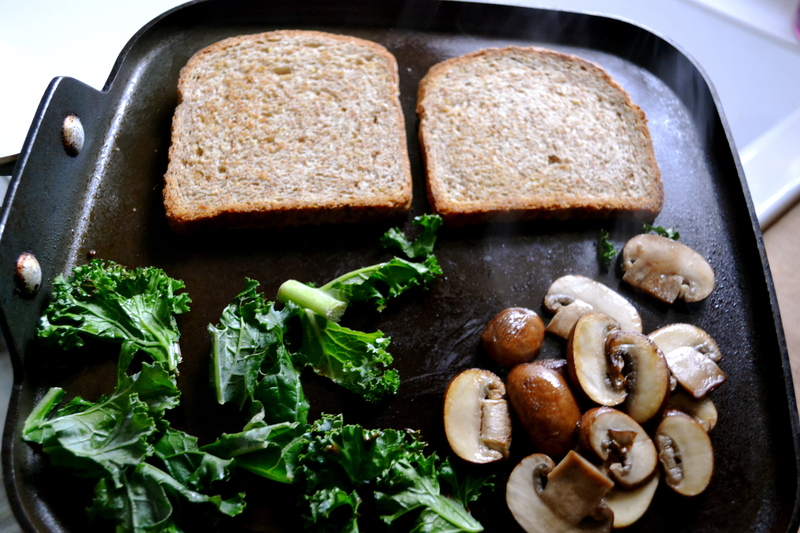 Place the bread on the griddle pan. Toast the bread about 1 to 2 minutes. Flip bread. Spread the toasted side with dijon mustard and then sprinkle the cheese on top. Put the hot sautéed veggies on top of the cheese. Salt and pepper. Top with the other slice of bread. Toast the sandwich on both sides for another minute or so.